Launched in 2007, HERCULES I is the perfect performance yacht, with sleek and sporty lines and the speed to whisk you to your next dazzling location, but also an ideal charter yacht for family and friends. HERCULES I offers relaxation and fun with a vast sunbathing and lounge area on the foredeck, ensuring total privacy while enjoying the sun. The aft deck sunbathing area offers a heated Jacuzzi with its cover in place – it’s the perfect place to sip a glass of Champagne at sunset. 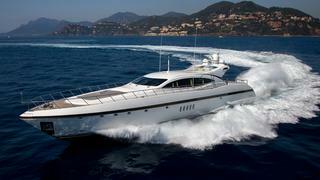 A truly sporty yacht from Italian builder Overmarine, HERCULES I comfortably cruises at 30 knots. She has watersports toys, a jet skis and sunpads for lounging around. No matter what activities you’re in the mood for, her friendly crew will ensure that guests have an unforgettable time on board.